You will receive 4 separate MP3 files. A total playing time of over 40 minutes. See ADDITIONAL INFORMATION tab below for detailed information. Meditation is deeply restorative, relaxing, and balancing. When used on a daily basis, meditation reduces stress and anxiety. Guided meditation and visualization make powerful well-being allies. 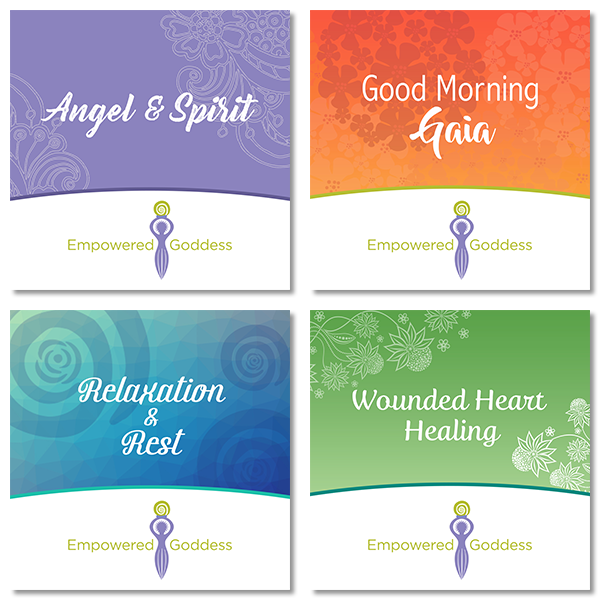 Empowered Goddess guided meditations will move you into a relaxed state of being which opens the energetic door into healing balance. 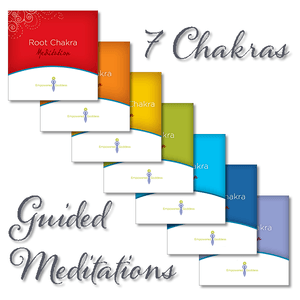 These downloadable guided meditations are narrated and written by Rev. Ann Rene. Each meditation is energetically infused and imprinted with sacred geometry, numerology, and the vibrational healing essence of love and light. Thank you to Max Height Web Solutions, and the very talented Jeffrey Atherton, for creative assistance in musical composition, recording, and mixing of these beautiful audio downloads. 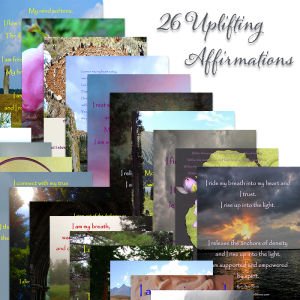 Empowered Goddess Guided Meditations are sold in a MP3 digital format and can be played back again and again on your computer and other compatible devices. Once purchased, you will receive access to the download link(s) for downloading your MP3 files. The Angel and Spirit Guide Connection Guided Meditation is 12:34 minutes in length. You are not alone. Whether you realize it, or not, your guides surround you at all times. Gaining and maintaining open communication with your guides provides a much needed bridge between your earthly experience and the higher realms. 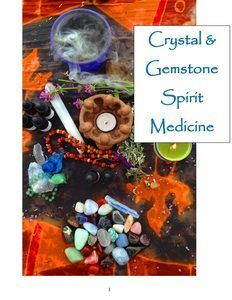 This open connection is vital to your energetic, intuitive, spiritual health, and holistic well-being. Direct communication with your guides and healing allies opens the door to feeling supported in the darkness and can turn confusion into clarity. This soothing guided meditation facilitates an empowered open communication and connection with your guides. The Good Morning Gaia Guided Meditation is 9:29 minutes in length. Begin your day grounded in nature and supported by Gaia’s nurturing connection. This refreshing yet relaxing guided meditation facilitates healing, deep clearing, energetic harmony, solid grounding, and balance on all levels. Awaken and move through your day energetically clear, balanced, and grounded. When used regularly, the Good Morning Gaia meditation clears and opens up your energetic connection to Mother Earth. This allows you to receive a consistent flow of Her deeply healing and nurturing energies. Powerfully supportive on all levels, this guided meditation is the perfect way to start your day. The Relaxation and Rest Guided Meditation is 11:25 minutes in length. The latest scientific research shows the importance of stress reduction in maintaining longevity, health, balance, and well-being. This deeply relaxing guided meditation supports stress reduction, holistic balance, and well-being on all levels. Nightly use of this soothing meditation facilitates and supports your body and mind’s natural healing process. The Relaxation and Rest Guided Meditation makes a great addition to any bedtime routine, assisting in winding down at the end of the day and supporting a movement into a sleepy state of being. The Wounded Heart Healing Guided Meditation is 14:23 minutes in length and supports the energetic healing of the wounded heart. Unaddressed heart wounding affects you on all levels and particularly the areas of your relationships, creativity, and abundance. This guided meditation facilitates the clearing, healing, and reclamation of the energetic heart and your relationship space as sacred. If you have experienced a broken heart or are struggling with heart based grief, The Wounded Heart Healing meditation provides beautiful healing support along your path back to a more balanced state of being.